Solutions: Case Study – Beer or Cancer? We are given the information that the government provides $50,000/year for the department to conduct cancer research, and the costs of operating the research lab is $30,000. Philips offers $70,000/year to do beer research, but researching beer would increase costs by $5,000. The best way to find our cost breakdown is to put this information into a table, where we can make a side by side comparison of the two options. In the cancer research column, we have a total revenue of $50,000 from government funding, minus explicit operating costs of $30,000. This leaves us with accounting profits of $20,000. Likewise, in the beer research column, we have total revenue of $70,000 from Philips, minus $30,000 + $5,000, or $35,000 in explicit operating costs. This leaves us with accounting profits of $35,000. Since we have already calculated the accounting profits and know that Cancer research gives $20,000 of profits, whereas beer provides $35,000, we know that the department will choose beer research. 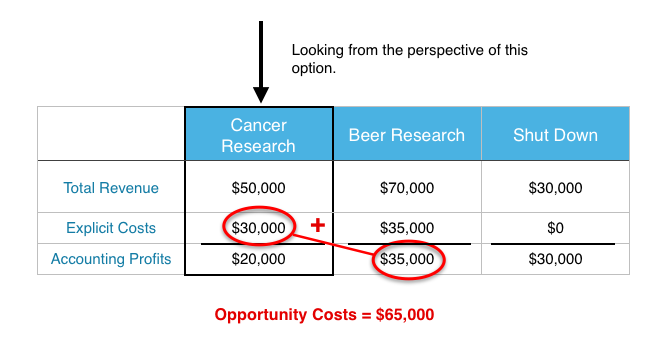 Finding opportunity costs is the same process as before, except now our explicit costs are the operating costs of the beer lab, and our implicit costs are the forgone profits from cancer research. Economic profits are the difference between total revenue and all the costs of an action, implicit and explicit. With a total revenue of $70,000 from Philips, our economic profits are equal to $70,000 minus our previously calculated opportunity costs. Since $70,000 – $55,000 = $15,000, our economic profits from beer research are $15,000. If the department was offered $30,000 to shut down, this just creates another option. Remember that opportunity cost includes the implicit costs of the next best alternative. This means we must determine whether is is better for the lab to shut down, or to work with Philips. We know that the accounting profits from a partnership with Philips are equal to $35,000. Since shutting down has no explicit costs, the accounting profits are only $30,000. This means that partnering with Philips is still our next best alternative. Opportunity costs will therefore be the same as in question 1 and equal to $65,000. Total Revenue from Cancer Research – $30,000 must equal $35,000 to ensure that the department is indifferent. To cover the explicit ($30,000) and implicit ($35,000) costs of cancer research, the government would have to pay $65,000 (an additional $15,000 to the original $50,000). The answer to question 5 gives us an interesting insight about how opportunity costs can affect compensation. Whereas before the department may have been content accepting $50,000 in funding, now, knowing they can earn more elsewhere, will require more. This can result in funding being increased with no change to the actual quality of work. Notice that explicit costs are denoted by ‘x’ to represent that, while we don’t know how much they are, they are assumed to be the same. This cost would represent the cost of living associated with either job. Solving for C we find C = $60,000. This means that the economist would need to be paid $60,000 to join academia. Doing the same process for the business prof, we would find they would have to be paid $80,000 to join academia. This can help explain why profs from different departments can have very different compensation. Ultimately, it depends on the job prospects they would have outside of the academic sphere. Previous: Case Study – Beer or Cancer? Solutions: Case Study - Beer or Cancer? by University of Victoria is licensed under a Creative Commons Attribution 4.0 International License, except where otherwise noted.